Today, is my last day working at the Career and Academic Planning (CAP) Center for the Hull College of Business at Georgia Regents University. I am moving forward because I will be leaving for Statesboro in a week! It still hasn't hit me that I will be leaving... I was offered this job on my Orientation day in 2013, because my boss knew me from when I was in high school, and was very impressed with me. For the past year, I have been working as the student assistant in the CAP Center, however, I don't consider my title as Student Assistant, I consider it as an Executive Assistant job, I'm just doing it as a student! 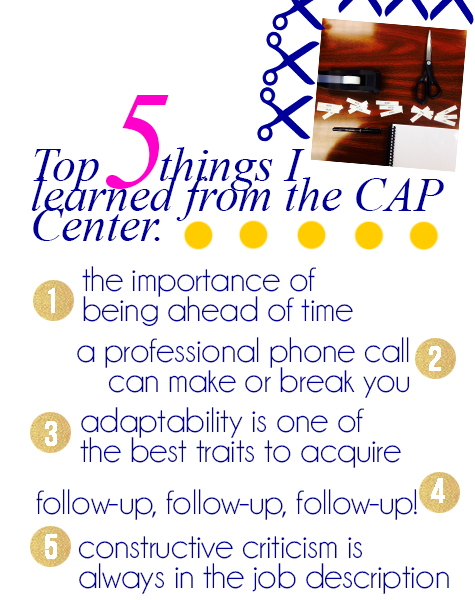 I have learned so much from working at the CAP Center, but these are my top 5 things! The importance of being ahead of time: This summer, I have worked Monday-Thursday 8AM-5PM, almost like a full time job. In my days, however, time seems to go by so quickly. I will feel like I've been at work for an hour, and then I'm going on my lunch break. Getting to work ahead of time is a very important thing to do. Why? Because it shows your bosses that you are serious about working, and being ahead of time ensures that you will be able to get settled before the start of the busy work day! A professional phone call can make or break you: The first thing I learned to do at the CAP was how to professionally carry a phone conversation. Every time I answer the phone, I say: "Hull College of Business, this is Rickey speaking. How can help you? ", that little "script" gets me mentally prepared to have a conversation about business with the person on the other side of the phone. Vice versa, when I have to make calls, and equally leave voice mails, I make sure to start off with a salutation, then introduction of self, and then my reason for calling, then I always end with "Thanks, have a great day!" Having a phone conversation is just as important as having a face-to-face conversation, excellent communication skills are a must. Adaptability is one of the best traits to acquire: In the world of student services, things change constantly. At the CAP Center, I had to be willing to adapt to all of the changes in the office. From the way we scan papers, to the way we advise students, to even the courses that the students take, I always had to change something about what I was doing, BUT, I'm glad about that because when I start my career, it'll help me develop as a young professional. Follow-Up, Follow-Up, Follow-Up! : Too many times do I get phone calls, and I have to follow-up with someone to give them the answer to their question, schedule an appointment, etc. Following-Up is almost just as important as the original phone call itself. Letting a client know that you have looked into their situation and are following-up with them, is like a little personal reminder that you care! Constructive criticism is always in the job description: This was one of the hardest things for me to learn. I am a very... passionate person. What I mean is, when I design or create something, I instantly fight for it, and it used to hurt my feelings when my boss and supervisors would give me their constructive criticism. Then one day, I realized that I needed constructive criticism to make my things look better. My supervisor would tell me that when people ask you to create something, they don't know what they want, but they know what they don't want! Always remember than constructive criticism is first CONSTRUCTIVE, and that it's meant to help you, and not hurt you. My time at the CAP Center was truly a time of fun and professional development! I wouldn't change my experience for anything in the world, and I hope that my next position can be somewhat parallel to the time I spent at the CAP Center.